The System T installed consists of a 3-bay, 48-fader S500 control surface and a 16-fader remote fader tile in the sound control room. The Hospital Club Studios, a multipurpose production facility and private members’ club in London’s Covent Garden, has completed a significant upgrade of its audio facilities that is centered around a new System T mixing console and audio networking technology from Solid State Logic. Conceived by Paul Allen (Microsoft co-founder) and Dave Stewart (Eurythmics) in 2004, the unique venue serves as a media hub that brings people from all corners of the creative content multiverse together in one environment. It features a TV and music studio, private members’ club, bar, restaurant, hotel, gallery, event space, and live music venue. Simon Wall, Sound Supervisor at The Hospital Club for 14 years, said that the majority of facility’s projects are television programming for commercial production companies and broadcasters. Recent shows include “Frankie Boyle's New World Order,” “John Bishop: In Conversation With..,” “Richard Osman’s House Of Games,” and “Vic & Bob’s Big Night Out. The studio occupies the two basement levels with ample lift access from the drive-through loading bay two floors above. The sound control room is on the same floor, with the production gallery one-up, on the first basement level. There used to be an additional audio control room next to the gallery, but that has become a new flexible gallery 'annex' that can be whatever a production demands - including an additional audio control room. 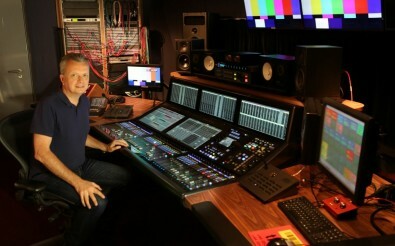 Simon Wall, Sound Supervisor at The Hospital Club, at his new Solid State Logic System T console. Wall said the sound control room is not a typical broadcast space and feels more like a high-end music studio, populated by generous racks of classic outboard gear, furniture by AKA Design, and a rear seating area. It is intended to be a multi-purpose room, equipped for broadcast TV clients and music producers. The SSL System T console installed consists of a 3-bay, 48-fader S500 control surface and a 16-fader remote fader tile in the sound control room—the separate fader tile can be moved anywhere on the Network, and be coupled with the T-SOLSA PC control application and touch screen. In the Machine room, there is an SSL Tempest T80 800-path audio engine and a range of SSL Network I/O devices, including ten A16.D16 units (combination of mic, line, and digital I/O), alongside MADI, SDI and AES interfaces. There are also several movable, flight-cased stage racks populated with SSL Network I/O SB 8.8 and SB.32.24 Dante networking-compatible stageboxes. A good proportion of the racked I/O has been set aside for the wide range of outboard kit in the studio. The facility has plenty of structured cabling to provide for the primary and secondary (redundant) Dante networks that are the main audio transport and routing infrastructure - configurable and controllable directly from the System T console screen. Wall said he is making the most of the facility’s Dante network and AES67 audio networking compatibility by upgrading The Hospital Club's comms system to the new Riedel Bolero wireless system, and using a Yamaha QL-1 console (Dante-equipped) for simple PA control and stage holdback. Editor's Note: The SSL System T will be on display at the 2018 IBC Show in Amsterdam this month.